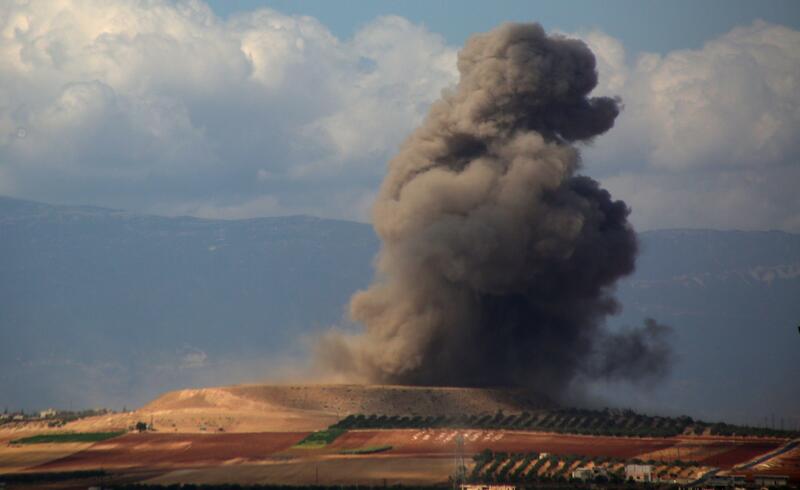 Russian airstrikes resumed Friday morning in Syria, pounding rebel positions in Idlib province. Syrian government forces resumed shelling of rebels there. At least one person was killed and several others wounded. The attacks come amid repeated warnings from the U.S. against an all-out assault by Syria's Russian-backed forces to retake Idlib, the last major area held by the armed opposition in Syria. Speaking Thursday at the United Nations Security Council, U.S. Ambassador Nikki Haley said the Assad regime "and its backers must stop their military campaign in all its forms to allow the U.N.-led political process to have a chance to succeed." "The Trump Administration and the international community have made it clear that there is no military solution to the Syrian conflict," Haley told the Council, which was to hold another meeting Friday on the crisis in Idlib. President Bashar Assad's "brutal regime -- backed by Russia and Iran -- cannot continue to attack and terrorize Syria's citizens. With millions of civilians at risk, an offensive against Idlib would be a reckless escalation." Russian President Vladimir Putin and Turkish President Recep Tayyip Erdogan arrived Friday in Tehran for a key trilateral summit on Syria which focused on the fate of Idlib. Erdogan and Putin along with their Iranian counterpart Hassan Rouhani held a series of bilateral meetings before they all sat down together. Putin was to hold a meeting with Iranian Supreme Leader Ayatollah Ali Khamenei on the sidelines of the summit, according to Russian news agency TASS. Russian presidential aide Yuri Ushakov said the leaders would focus on the situation in Idlib, and the expected chemical provocation in the area. Russia has suggested the rebels could use chemical weapons in a final battle for the rebel stronghold. The U.S. and its allies, however, believe it is Assad's forces who appear to be preparing a chemical attack in Idlib. The Trump administration's new envoy to Syria, Jim Jeffrey, told the Reuters news agency this week that he was "very sure that we have very, very good grounds to be making these warnings" about an upcoming assault on Idlib, and that while "any offensive is to us objectionable as a reckless escalation. There is lots of evidence that chemical weapons are being prepared." Earlier this week U.S. Ambassador Haley warned the Syrian regime, which has been accused repeatedly of using chemical weapons against its own people during the civil war, specifically against doing so again in Idlib. President Trump has previously labelled Assad an "animal" for using the banned weapons, and called Iran and Russia "responsible for backing" him. The summit in the Iranian capital ended Friday with Turkey, Russia and Iran agreeing that more coordination is needed on Syria and that a peaceful end to the conflict is possible if all terrorist groups lay down their weapons, but no clear agreement on how to resolve the crisis in Idlib emerged. While the three leaders seemed to agree on the need to end the U.S. military presence in Syria, Erdogan pressed his Russian and Iranian counterparts to declare a ceasefire for Idlib. He warned against a bloodbath in the province and said a military solution in Idlib could lead to the collapse of the political process in Syria. He added that the decision on what to do in Idlib will determine the future of cooperation between the three nations in Syria. Iranian President Rouhani, who appeared to be seeking a middle ground between Putin and Erdogan, said the terrorism issue in Idlib should be addressed, but measures must be taken to prevent harming civilians in Idlib. Russia's Putin rejected Erdogan's call for a truce, saying the defeat of terrorism in Idlib was "inevitable" and adding that the Syrian government should restore control over all of its territory. Putin offered Erdogan a compromise, however, saying at a joint news conference after the summit that Russia was willing to honor individual ceasefire agreements with armed groups in Idlib that agree to lay down their weapons. He also warned that any "provocations" such as recent drone attacks on the Russian Hmeimeem base in Lattakia, would be met with immediate military retaliation. There was no direct mention of Idlib in the final communiqué issued by the three countries on Friday, which stated only that they "reaffirm their determination to continue cooperation in order to ultimately eliminate DAESH/ISIL (ISIS), Al-Nusra Front (al Qaeda-affiliates) and all other individuals, groups, undertakings and entities associated with al-Qaeda or DAESH/ISIL," and that the "separation between the above-mentioned terrorist groups and the armed opposition groups that had joined or would join the ceasefire, would be of utmost importance." The communiqué concluded by stating that the next meeting between the three countries, which typically convene every six months, would be held in Russia, but no date was specified. The outcome of Friday's meeting will be closely watched by the U.S.
"We will find out to some degree tomorrow if the Russians are willing to come to a compromise with the Turks," U.S. envoy Jeffrey told Reuters on Thursday. "I think the last chapter of the Idlib story has not been written. The Turks are trying to find a way out. The Turks have shown a great deal of resistance to an attack." Jeffrey warned of the risks of an offensive on the province and said the U.S. wouldn't "tolerate an attack (on Idlib), period!" According to the UN, Idlib is home to about 2.9 million civilians, including 1.4 million displaced from other parts of Syria. There are an estimated 30,000 rebel fighters still in the area, including some 10,000 al-Qaeda-linked militants.